Hail! Hail! The Gang's All There! Talk about your cruise industry powerhouse. This group of top execs from Carnival Corp and Fincantieri were at the Koningsdam handover on Thursday at the Fincantieri yard in Marghera. Of course the thing nobody knew at that time was that they were also finalizing an order for five additional ships. 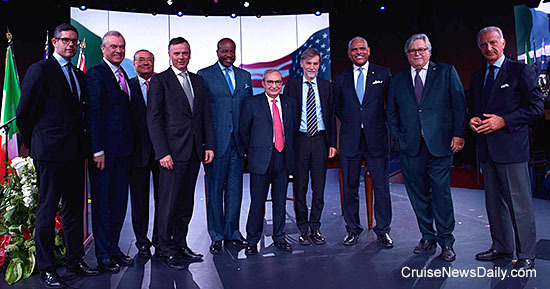 Pictured below are (from the right): Vincenzo Petrone, Chairman Fincantieri; Micky Arison, Chairman Carnival Corporation & plc; Arnold Donald, President and CEO Carnival Corporation & plc; Graziano Delrio, Italian Minister of Inftrastructure and Tranport; Giuseppe Bono, CEO Fincantieri; Orlando Ashford, President Holland America Line; Michael Thamm, CEO Costa Group; Corrado Antonini, former Chairman Fincantieri; Stein Kruse, CEO Holland America Group; Neil Palomba, President Costa Cruises. Carnival Corp announced today they have finalized an order with Fincantieri for five ships to be delivered in 2019 and 2020. 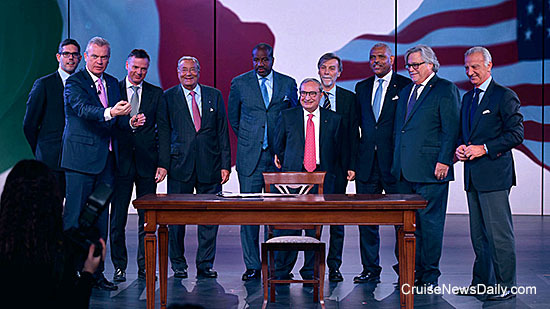 The papers were actually signed during the delivery ceremony on Thursday for Holland America's Koningsdam. The order consists of two ships for Costa Asia, one for P&O Australia and two for Princess Cruises. When the MOA was announced in December, it was only a four-ship order with only one vessel for Princess. Details will be in Monday's edition of Cruise News Daily. The CDC just released the results of the public health inspection of P&O's Oceana on March 1, and the ship failed with a score of only 82. A ship must have 86 to pass. All of the ship's past inspections have scored at least 95, but the ship isn't in the US often, and it has only been inspected eight times since November 2002. The last inspection before the one in March was January 31, 2012, and it scored 95, but that was more than four years ago. Things have changed since. 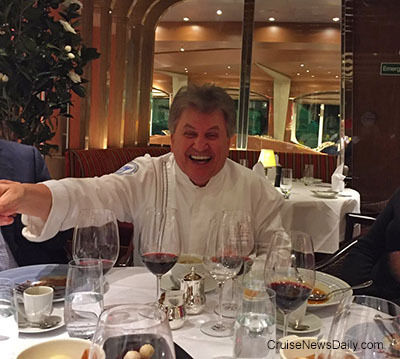 The complete story appeared in the April 1 edition of Cruise News Daily. A challenge the crew of Koningsdam faces being the first HAL ship to muster passengers indoors. Viking Ocean Cruises' second ship was just delivered last week, but the two ships have already crossed paths at a port of call. Carnival plans to launch Carnival Triumph at its new home port on Monday with a unique New Orleans competition for charity, funded by the cruise line. Because the day breaks earlier in Australia than it does in the US, our friends at Carnival Australia broke the news this morning of an addition to the Carnival Cruise Line fleet that won't be assigned to North American waters. Since our beginning, Carnival has been a pioneer in high seas travel. We are therefore proud to announce the newest vessel to our Australian fleet, a world-first in ocean tourism. 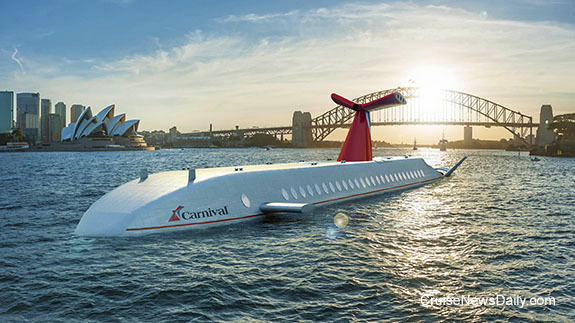 Welcome to the next generation in cruising – Carnival Submarine. Carnival Submarine is a totally immersive experience (literally!) that encapsulates everything unique about a traditional Carnival cruise combined with upgraded facilities and brand new additions to your favourite areas. Your kids will love the newer, truer Camp Ocean, now with a full-length acrylic glass feature wall, transforming the space into an underwater aquarium. For fans of Alchemy Bar, why not pop in for one of two specially created cocktails: the Yellow Submarine and Deep Blue Sea. Afterwards, break out the bright colours for our newest theme night: Octopus’ Garden – bonus points for best sea creature inspiration. And for those who love the Green Thunder, be sure to try The Green Under – the fastest and steepest water-slide under the sea. Carnival Submarine’s maiden voyage will be diving in January 2017. Be sure to book now for the world’s most innovative travel experience. Rendering courtesy of Carnival Cruise Line. All rights reserved. May not be copied or used without permission. Of course April Fool's Day starts earlier in Australia than it does for those of us in the US. Fincantieri delivered the 99,500-ton Koningsdam to Holland America this afternoon at their Marghera yard. M/S Koningsdam is the first of the Pinnacle class. 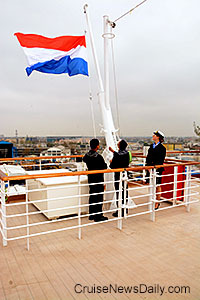 The papers were signed by Holland America president Orlando Ashford and shipyard Director Antonio Quintano, and that signaled for the flag change to take place where the Italian flag was lowered and the Dutch flag was raised for the first time. Koningsdam is registered in the Netherlands. Norwegian Cruise Line Holdings said today they have contracted with Fincantieri to build a sister to Seven Seas Explorer for their Regent Seven Seas brand. St. Croix hasn’t exactly had a teeming with cruise ships for some time, but local media on the island is reporting that the port is facing a summer without any cruise ship calls at all. The US Virgin Island has no calls scheduled for June, July or August. Norwegian Cruise Line released details about Norwegian Joy which will join the fleet in the summer of 2017 and will be based in China year round. Why should you care since you don’t live in China? The ship has more new features than usual, and some of them are really cool. You should care because many of them are probably going to show up on later Norwegian newbuilds, or some could likely be added to existing ships in future dry docks. Royal Caribbean International has decided that it’s time for a raise - for the crew - and they’re depending on you to provide it. Gratuities will increase for passengers sailing May 1 and after. 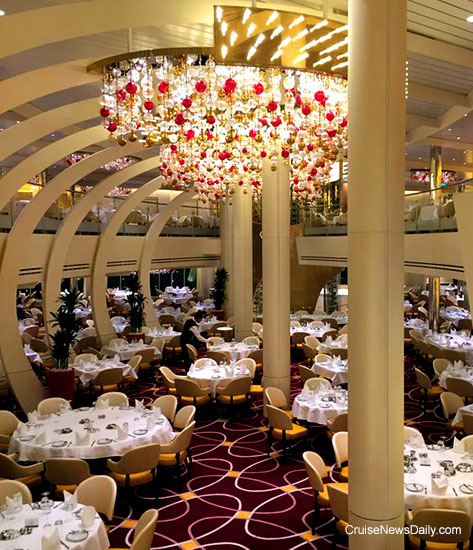 “When guests step aboard the all new Pride of America they will be amazed by the breadth of this renovation,” said Andy Stuart, Norwegian Cruise Line’s president and chief operating officer. Passengers aboard Caribbean Princess earlier this month had quite an “entertaining” week. Princess was holding their annual Entertainer of the Year finals aboard the ship, and they got to see shows by each of the finalists chosen by Princess management. After seeing all four of Princess’ best entertainers (a singer, a magician, a comedian and a keyboardist), they had to vote for the one to be named Princess’ Entertainer of the Year. “It’s common for vacationers to want to test out the local beer,” said Jon Carpenter, Concrete Beach Brewery’s Brewmaster, and thanks to CBB, Carnival Vista will have its own local beers. “Carnival Vista has taken the concept of local, and applied it to the decks of their ship,” he said. Carnival Cruise Line has partnered with Concrete Beach Brewery to create three distinctive craft beers based on what Carnival Vista’s passengers will want in beers, and they will be unique to Carnival Vista when it debuts in May.